CONNECTICUT -- City police are determining whether they can file a criminal charge against Norman Fortier Jr., who resigned as deputy animal control officer last week after he was seen drowning a badly injured cat last month. Detectives will give a prosecutor their evidence to find out whether Fortier can be charged with cruelty to an animal, Chief John DiVenere said Wednesday. ``[Det. Lt.] Tom Killiany is working on a warrant application right now. I think it will go to the prosecutor next week,'' DiVenere said. Earlier Wednesday, Mayor William Stortz issued a public apology for Fortier's actions. Repeated efforts to contact Fortier on Wednesday were unsuccessful. Peter Kot, president of the city's police union, which represented Fortier before his resignation, would not discuss the case, calling it a personnel matter. Police said they began an internal affairs investigation after a Plymouth animal control officer reported watching Fortier deliberately drown a badly hurt cat at the city's animal pound on March 31. DiVenere said Fortier's explanation was that the cat was not likely to survive long enough to take to a veterinarian. It's unclear when Fortier first brought the cat to the pound on Vincent P. Kelly Road. The Plymouth animal control officer, who uses space at the Bristol facility, found the bleeding animal there at midday on March 31 and notified police. Fortier arrived soon afterward, according to police. The Plymouth officer reported that Fortier then drowned the cat in a container of water. ``That's completely contrary to our values and our normal procedures. It's incredibly unfortunate,'' Lt. Thomas Grimaldi said. Injured animals are taken to veterinarians, who decide whether they can be treated or must be euthanized, Grimaldi said. Grimaldi said Fortier was put on administrative leave immediately after police commanders learned of what happened. ``He was forthright with investigators, but didn't give much of an explanation except that he didn't think the cat could have been saved. Our position is that it wasn't his decision to make,'' Grimaldi said. Fortier submitted a resignation letter Friday, shortly before he was to face a disciplinary hearing, according to Grimaldi and DiVenere. Fortier, 54, was hired as deputy animal control officer in 2000. He was paid about $38,000 a year for the full-time job under the latest police contract. FLORIDA -- A father of three shot and killed his neighbor's pit bull after the dog bit his 15-year-old son and cornered the teen and his younger brother in a bedroom of their home, police said. Greg Hernandez said he received a frantic phone call Monday night from his son, Dakota Liles, who was screaming that the neighbor's dog, Bruno, was after him. Liles and his brother, Dominic Hernandez, had taken their dog, Diamond, to their backyard, which they share with Bruno's owner, and the 80-pound pit bull ran at the boys, the boys' father said. The pit bull bit Dakota Liles' leg and wouldn't let go, the teen said. He and his 13-year-old brother ran into their home, in the 2400 block of Thomas Street, and Liles pushed Bruno aside just as Diamond jumped on top of the attacking pit bull, Liles said. The brothers ran to a back bedroom and shut the door. Their older brother, Dalon Liles, who had been in the kitchen, fled outside and watched the dog almost busting through the door. "I saw the dog ramming its head and biting the door knob," Liles said. "He wanted to kill them. There was no stopping at all. It was just rage at the door." That's when their father said he arrived with a neighbor's gun and shot the dog four times. The dog came toward him while he was shooting and then ran out the door, collapsing a quarter-mile away, he said. Paramedics treated Dakota Liles at his home and his father took him to a doctor, police said. Diamond, a mixed-breed dog a little smaller than the pit bull, had a few scratches. The pit bull's owner, Candy Lee Salos, said her dog is usually chained while it's in the backyard and she doesn't know how it got loose. The 7-year-old dog is aggressive toward anyone except Salos, said her live-in boyfriend, George Perez. It once bit him on his leg, he said. The couple said they were at work during Monday's attack. Police are investigating and have not issued any citations. The teen has two puncture wounds on his left calf and is out of school for 10 days, his father said. The younger brother has not slept in his room since the attack because he's scared, Greg Hernandez said. Liles, a freshman at South Broward High, was taking antibiotics and pain medication Tuesday and said he was happy he wasn't hurt worse. Hernandez said that while his children were terrified to go near the pit bull, he befriended the dog. He fed Bruno hot dogs until the dog would take them from his hand -- something Perez backs up. Hernandez said he feels bad he killed the dog. He said he and his family, who've owned pit bulls in the past, thought the dog was "beautiful" and saw how gentle he was with Salos. This attack comes on the heels of a vicious attack by a pack of dogs -- that included pit bulls -- in Deerfield Beach in March that left a man in critical condition. Last year, a large breed dog, a Presa Canario, fatally mauled his 30-year-old owner in Coral Springs. Police shot the dog after the attack. Hollywood Commissioner Cathy Anderson, an animal lover, has often pushed to get restrictions against pit bulls within city limits. She said she was frustrated by the state law that makes it illegal for breed-specific bans. Only Miami-Dade has a ban against pit bulls, passed before the state law took effect. "I wish we could do something about it," she said. North Carolina: Girl, Horse Fend Off Pit Bull Attack; dogs quarantined but then what? Hand them right back to the owner so they can kill a child next time? NORTH CAROLINA -- Days after it was attacked by a pit bull, a Hoke County horse is ready to compete in the Stoneybrook Steeplechase on Saturday. Twelve-year-old Casey Rounds was riding her horse, Diesel, from her home to the Carolina Horse Park last Sunday when a pit bull began chasing the horse. "This pit bull was chasing and biting his heels, but we kept going and outran him," Casey said. But the pit bull wasn't done. As Casey and her mother rode home, the dog attacked again, chasing Casey and Diesel to an intersection where they had to stop because of traffic. "It was a nightmare in front of my eyes. 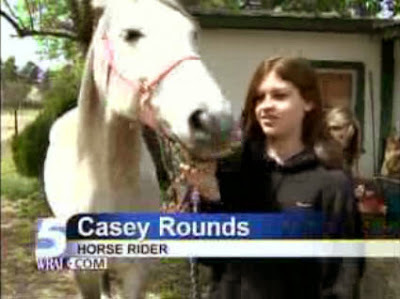 I kept worrying about Casey and the horse," Michelle Rounds said. "I was trying to kick him with my foot to get him off. Then, (Diesel) reared up," Casey said, adding that she fell off the horse but landed on her feet. "Then I was on the ground, kicking the dog, and (Diesel) started running." Diesel harnessed all his horsepower and outran the dog, finding his way home on area trails. The dog punctured the horse's side and tore at his chest. Local animal control officers took custody of the pit bull on Wednesday and will keep it in quarantine for 10 days. And then what? Hand it right back??? The dog's owner declined to comment on Friday. But Casey said Diesel hasn't run out of gas. After a week of rest, he will be ready to run in the steeplechase, she said. "I'm planning on winning," she said.